Background: Using cell phones while driving contribute to distractions which can potentially cause minor or major road traffic injuries and also stress among other drivers. With this background, the study was done to ascertain the proportion of handheld cell phone use while driving among road users in Mysore city and also patterns of the use by the day of week, type of road, and type of vehicle. Methods: The study was conducted in Mysore, Karnataka, India. Four stretches of roads were observed thrice daily for 1 week. The total number of vehicles passing through the stretch and the number and characteristics of drivers using hand-held cell was noted. Pearson's Chi-square test was used to ascertain the significance of the difference in proportions. Results: The overall proportion of cell phone users was calculated as 1.41/100 vehicles. The observed use of handheld cell phones was 1.78 times higher on nonbusy roads than busy roads (Χ2 = 25.79, P < 0.0001). More than 50% of the handheld phone users were driving a two wheeler, the proportion being 50.5% in busy roads, and 67% in nonbusy roads. There was no difference in the proportion of cell phone use by time of the day or across different days of the week. Conclusions: The proportion of drivers who use cell phones is found to be relatively lower, and use of cell phones was higher on nonbusy roads. Cell phones are, undeniably, a part and parcel of modern life. With the advent of smartphones, cell phones are no longer merely instruments providing on-the-go connectivity; they are also platforms of seamless entertainment through the Internet and social media. There has been a steady rise in cell subscribership globally, reaching 67/100 inhabitants at the end of 2009. Growth in cell phone subscriptions is fastest in low- and middle-income countries where there are now twice as many cell phone subscriptions as in high-income countries. India has one of the highest numbers of wireless phone subscribers in the world; as of June 2016, there were of 81.35 telephone users per 100 population. While cell phones are necessary in many situations, their use while driving is detrimental to safety. Using cell phones can cause drivers to take their eyes and minds off the road, and hands from the steering wheel leading to visual, cognitive and physical distractions from the primary task of driving. Such distractions can potentially cause road traffic injuries leading to loss of life and limb of not just the distracted driver but even of other road users. According to the WHO, drivers using a mobile phone are approximately four times more likely to be involved in a crash, the risk being similar for both handheld and hands-free phones. As expected, using mobile phone while driving is an offence under section 230 (A) of Karnataka Motor Vehicles rules and section 177 of the Indian Motor Vehicles act and may attract a fine of Rs. 100 per offence. Cellphone use while driving, a potential risk factor for road traffic injuries, has been of research interest across the globe. Knowledge about the burden of risk factor can help in the formulation of preventive measures and public policy. A study by Shaaban found that around 11.48% of the vehicle drivers in Qatar were using cell phones while driving. Similarly, Wilaiwanand Wattanasoei reported that more than half of their study participants in Urban Thailand have experience of smartphone usage while driving. The burden of cell phone use while driving is not clearly known in India. Hence, the present study was conducted to ascertain the proportion of handheld cell phone use while driving among road users in Mysore city and to ascertain the patterns of the use by the day of week, type of road, and type of vehicle. This was an observational study. The present study was conducted in the South Indian city of Mysuru. Mysuru, previously known as Mysore, has an extensive network of inter and intracity roadways. The authors identified four stretches of roads in Mysore city conveniently at the center of the city, out of which two were busy, and two were not busy with respect to the volume of traffic. These roads were selected on personal communication with RTO as busy and nonbusy as termed by RTO. Each road was observed for 7 days (on all days of the week) thrice a day (morning, afternoon, and evening) for 1 h each. Seven days of the week were considered to get representation of mobile phone use across the week and 1 h each during three different times of day was taken to get the round the day representation. This serves the time of the day, as a variable. There were 2 observers at each of these places, one looking at the total number of vehicles passing that road, other looking at number of people using cell phone. The second person was also noting gender of the person using cell phone. The observers were using the tally sheet to tick numbers. The observation was also done regarding the type of vehicle (2 wheeler, 3 wheeler, or 4 wheeler) and the gender of the driver. The final data comprised total number of vehicles passed through the particular road, total cell phone users while driving, gender distribution, and type of vehicle of users of cell phone. The data collection was completed between April and May 2014 during which 22,139 vehicles were observed. The total number of handheld cell phone users and the proportion of users per 100 vehicles were calculated. The level of significance was set at P < 0.05. Chi-square test was used for comparison of proportions. All statistical calculations were done using IBM SPSS Statistics version 21.0 was used (IBM Corp., Armonk, NY, USA). The study was conducted by observing two stretches of busy road (namely, Sayyaji Rao road and Irwin road) and two stretches of nonbusy roads (Vinoba road and Ramavilas road) for 3 h a day at three different times on all days of the week. The total number of vehicles observed on busy road was 17,241 and on nonbusy roads was 4898. The vehicle transit proportion was 821/h in busy road and 233/h in nonbusy road, indicating the validity of selection as busy and nonbusy roads. During the period of observation, 312 drivers were found to be using handheld cell phones out of which, 206 were on busy roads, and 106 were on nonbusy roads. The overall proportion of cell phone users was calculated as 1.41/100 vehicles. On busy roads, it was 1.20/100 vehicles and on nonbusy road was 2.14/100 vehicles. The observed use of handheld cell phones was 1.78 times higher on nonbusy roads than busy roads. The difference in the proportion of users on busy and nonbusy roads was statistically significant (Χ2 = 25.79, P < 0.0001). It was also observed that nearly all the users except a few were males. The most common type of vehicle driver using cell phones were 2 wheelers, followed by 4 wheelers, and 3 wheelers. This was same with both busy and nonbusy roads [Table 1]. More than 50% of the handheld phone users were driving a two wheeler, the proportion being 50.5% in busy roads, and 67% in nonbusy roads. The cell phone use proportion was same in busy and nonbusy road on Monday, Tuesday, and Saturday. It was notable to see significant difference in the cell phone use on Sundays, which was higher in nonbusy roads [Figure 1]. During mid-week (Wednesday, Thursday and Friday) also there was significant higher cell phone usage while driving on nonbusy roads compared to busy roads [Table 2]. The proportion of cell phone use according to the day of week and time of day is given in [Table 3]. 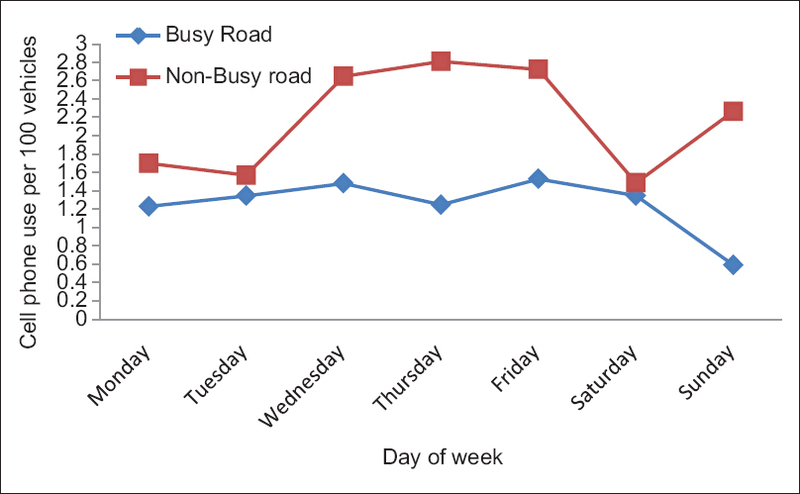 It was observed that there was significantly higher cell phone use proportion on nonbusy roads compared to busy roads, during all three observed times of the day. However, the observed pattern showed no statistically significant differences in cell phone use across time of the day or different days of the week [Figure 1]. This study found that the proportion of cell phone use among road users in Mysore city was 1.4/100 vehicles. This proportion is much lower than the findings of Shaaban, who used a similar methodology in Qatar city. A study by Young et al. employing a similar methodology reported that 4.8% of observed drivers in Melbourne, Australia were using cell phones while driving. A smaller questionnaire-based study among university students from Thailand also found that 51.9% of the participants have experience of smartphone usage while driving. Similarly, in a telephonic interview-based study in Canada by Nurullah et al. also reported that >50% of the respondents used their cell phones while driving in the past 12 months. The high proportions in questionnaire-based studies may be due to the inclusion of hands-free cell phone use which was excluded in the present study due to difficulty in observation of the same. The male gender preponderance found in our study was similar to the findings of Nurullah et al. and Shaaban. The reason for the male preponderance could possibly be due to the fact that in this part of India, vehicles are mostly driven by males. It is important to note that a large number of handheld cell phone users are two wheeler riders. Two-wheeler riders are vulnerable road users who may sustain serious injuries even at low-velocity crashes. In the event of a crash, they come in direct contact with the impacting vehicle and the energy transfer is high (even in low-velocity crashes) resulting in serious injuries and deaths. In fact, The World health organization's report on Cell phone use acknowledges that the cell phone use among motorized two-wheeler users is an area of growing concern, given the relatively low cost and popularity of these vehicles in low- and middle-income countries. How often a distracting activity will result in a crash will be a function of several factors: the proportion of the drivers who engage in the activity, the frequency and duration of time those drivers spend on it, and the relative risk conferred by it. Although the proportion of handheld cell phone use is found to be low in our study, the importance of focusing on it as a preventable risk factor of road traffic injuries is not diminished. Using a cell phone while driving can lead to slower reactions to traffic signals and more frequently missed signals, slower braking reactions with more intensive braking and shorter stopping distances, reduced general awareness of other traffic, more risks in decision-making, and compensatory behavior. All of these may be precedent to road traffic injuries. It is observed that road space in India gets used by various types of modern cars and buses, along with locally developed vehicles for public transport (three-wheeled scooter taxis), scooters and motorcycles, bicycles, tricycle rickshaws, and animal and human drawn carts. The road infrastructure design based on homogeneous traffic models has failed to fulfill the mobility and safety needs of such nonhomogenous traffic. Simulator-based studies by Chen reports that drivers undergo physiological changes related to increased stress, i.e., increase in heart rate and increased respiratory rate, increased sweat, and skin temperature. While studies on the stress levels of other drivers who share the road with those who talk on cell phones are not clearly understood, it is the personal experience of the authors that they feel unsafe and stressed when another driver is driving distractedly. Thus, handheld cell phone use while driving, and the resultant stress may be considered as an additional, avoidable risk factor of not only road traffic injuries but also other noncommunicable diseases. The biggest strength of this study is that it's a pioneering study in this part of the world; we were able to measure the burden of use of cell phone use while driving. This study was conducted as a fixed observational study. Hence, the time of observation of each vehicle was limited. The study was not able to measure incidence of cell phone use according to gender and type of vehicle because the denominator for both could not be measured with the available resources. This was a unique study methodology acting as a base design for future studies that can be done with increased number of variable with multiple observers at each station. The study reports low cell phone use while driving in small cities such as Mysore in India; use being more on nonbusy roads. Further, there was increase in cell phone use in mid days of the week on nonbusy roads. There is need for further studies with multiple observers so that multiple variables can be studied with regard to epidemiology of cell phone sue while driving. Cell Phone Use: A Growing Problem of Driver Distraction. Geneva: World Health Organization; 2011. Available from: http://www.who.int/violence_injury_prevention/publications/road_trac/en/index.html. [Last cited on 2016 Dec 05]. Telecom Regulatory Authority of India. Highlights of Telecom Subscription Data as on 30th April, 2016; 2016. Available from: http://www.trai.gov.in/WriteReadData/WhatsNew/Documents/Press_Release_No. 49_20_june_2016_Eng.pdf. [Last cited on 2016 Aug 23]. Mysuru Traffic Police: Traffic Fines – Mysuru City Police; 2017. Available from: http://www.mysorecitypolice.gov.in/contentpage.aspx?id=52. [Last cited on 2017 Mar 13]. Shaaban K. Investigating cell phone use while driving in Qatar. Procedia Soc Behav Sci 2013;104:1058-67. Wilaiwan W, Wattanasoei S. Behavior of Smartphone Usage While Driving Among University Students in Urban Area, Thailand. Proceedings of the IRES 6th International Conference, Melbourne, Australia, 16th August, 2015; 2015. p. 56-8. Available from: http://www.worldresearchlibrary.org/proceeding.php?pid=54. [Last cited on 2016 Dec 05]. Young KL, Rudin-Brown CM, Lenné MG. Look who's talking! A roadside survey of drivers' cell phone use. Traffic Inj Prev 2010;11:555-60. Nurullah A, Thomas J, Vakilian F. The prevalence of cell phone use while driving in a Canadian province. Transp Res Part F Traffic Psychol Behav 2013;19:52-62. Available from: http://www.ualberta.ca/~nurullah/Cell-Phone-paper.pdf. [Last cited on 2016 Dec 05]. McEvoy SP, Stevenson MR, Woodward M. The impact of driver distraction on road safety: Results from a representative survey in two Australian states. Inj Prev 2006;12:242-7. Mohan D. Traffic safety and health in Indian cities. J Transport Infrastructure 2002;9:79-92. Available from: https://www.researchgate.net/publication/235357321_Traffic_Safety_and_Health_in_Indian_cities. [Last cited on 2016 Dec 05]. Chen Y. Stress state of driver: Cell phone use while driving. Procedia Soc Behav Sci 2013;96:12-6.